Introduction - In this section I’m going to be looking at Back-Spinning deliveries other than the Flipper. Anecdotally, there’s potentially a handful of different back-spinning deliveries, but when you try and pin them down and establish which is what, who invented them and how they evolved, you’ll find that the information out there is very limited, vague and contradictory. In this section I’m going to try and clarify the deliveries that do exist and can be verified and makes sense of the confusion out there regarding the terms Slider and Zooter. Research – My approach to trying to get to the bottom of the murky origins of the back-spinners was to do so in the manner that an academic might use. Within academia it’s recognised that any serious research needs to quote established and recognised texts on the subject in order to be taken seriously. As I’ve intimated previously throughout the blog the information with regards to the origins and techniques of Wrist Spin Bowling are extremely limited – probably restricted to two sources, Grimmetts book Getting Wickets from 1930 and Peter Philpotts book The Art of Wrist Spin Bowling from 1996. Between these two books we’re able to establish that there are only two recorded and explicitly described back-spinning variations, the Flipper and the Orthodox Back-Spinner. Thereafter, all other variations of back-spinners I would argue are evolutionary deliveries that have yet to still be pinned down and described in print in the same manner that the two established deliveries have been. Other people will argue that there are several other deliveries and that these are well recorded and established. One of my aims is to present an argument that says that this is not the case. One key aspect of presenting your findings is that with secondary research - using the internet, to try and establish fact from fiction (and this does include this blog) you cannot trust the content. Using the internet for serious research is simply not acceptable because the writers are usually journalists or enthusiasts like myself. Another point that will be raised is that a lot of the commentary on these deliveries is made by the protagonists – Warne, Jenner, Benaud and other professionals. I’ll also make a case as to why this information is also sketchy at best. The problem with accessing learning materials on Wrist Spin Bowling is that there are so few books written on the subject by the innovators and experts in the field. I’m only aware of one other body of printed work that attempts to explain the deliveries in great detail and that’s Woolmers book 'The Art and Science of Cricket'. The book covers the subject fairly well looking at Shane Warne’s Delivery of the Century in detail, coming up with a very convincing theory as to how and why. But then he acknowledges that he isn’t an expert in the field and resorts to quoting Grimmetts Getting Wickets and Grimmett on Cricket, the very books from which much of my own material here is based on. I would argue that the most comprehensive book on the subject has still yet to be written by Warne. Potentially amidst all the bluff and psychology used by Warne over the years, there are definitive explanations of a handful of deliveries that either he invented or have been handed down over the generations since Grimmett. It wont be until Warne or Jenner perhaps sit down and collaborate and write definitive and published descriptions and explanations of the other deliveries will we ever be able to pin down exactly what a Zooter, Zinger or a Slider are. Throughout the blog I’ve written about the fact that the Wrist Spinners armoury is made up of two distinct methods of bowling, the traditional Wrist-Spinners action with the 2 up and 2 down grip with the ball being spun off the 3rd finger which is described through the use of Peter Philpotts round the loop theory. And Grimmetts squeezed between the finger and thumb Flippers. Both actions are able to produce balls that spin to Off, Leg, Forwards and Backwards using the variation of the wrist position when releasing the ball. The thumb pointing at the batsman and the ball flicked with the 3rd finger and wrist forwards – The Top-Spinner. The Thumb pointing anywhere towards Slips and Gully with the palm of your hand now slightly facing the bat as you flick should produce a Leg Break. The thumb pointing towards edge of the square directly to your left as you bowl with your palm now facing directly at the batsman will produce the Big Leg Break. As you’ve probably seen, the wrist position has moved further and further round through 90 degrees and there’s still potential for it to go further still. Hold you hand up and have it facing palm towards the batsman and flick the wrist and see that you will be rotating the ball with the spin anti-clockwise to the Left to get the big leg break. Now turn the wrist further round inwards another 90 degrees so that your thumb is facing you and the ‘Karate Chop’ edge of your hand is facing the batsman. If you now flick your wrist you will be Top-Spinning the ball in towards yourself (The 2nd drill). The ball is flicked back towards yourself with an up-right seam. Now the difficult bit; As you bring your arm over you need to keep the wrist in this acute position – your forward body motion as you explode through the crease and your arm coming over will propel the ball forwards and down the wicket as you flick the ball putting top-spin on it as in all your other deliveries, but you need to allow the ball to be released out of the back-off the hand and down the pitch. Because you’ve spun the ball hard in towards yourself, as you look at it, it will have forward spin, but as the batsman sees the ball, it will have back-spin. The seam should be dead straight and the back-spin will mean that the ball will hold its trajectory through the air far longer than your stock ball, so if bowled as a variation, the batsman will be expecting the ball to dip in the same way that your Leg Break should landing several feet in front of him. Instead the Orthodox Back-Spinner will land on a fuller length potentially catching the batsman out. Additionally with a perfectly upright seam there’s the potential that like the Flipper the ball may also swing? Finally, because of the upright seam and the back-spin the ball on hitting the wicket will stall and bounce irregularly. The suggestion is that a back-spinning ball will in most instances stay low and sneak under the bat where the batsman might be playing for a Leg Break and far more bounce. My own experience is that the bounce is irregular and dependent on a number of variables the ball will sometime rear up rather than stay low. Needless to say, all of this is subject to experimentation and trying it out to see what happens in your own situation. In my opinion this is possibly the most difficult of all the deliveries because of the acute angle of the wrist required in the delivery. With practice using the Inward Spinning Drill you’ll get a feel for it. Once you’ve got a sense of being able to do that with a good degree of control – take it outside and flick the ball up in the air and forwards either against a wall to watch how the ball spins on hitting the wall or off of the flat ground. You should be able to propel the ball forwards and observe that it then bounces back towards you. This is easy enough and looks very promising, but trying then to convert that into a full 22 yard delivery is another matter. A positive though that may come out of it though is, if you can get the accuracy and speed in the delivery and land it on a good length, you may find that attempting to get your wrist round so far with the inward flick, you’ll improve your Big Leg Break as the work that’s gone into learning the Orthodox Back-Spinner is an extension to the wrist position for the Big Leg Break. Another observation from people that bowl the Orthodox Back-Spinner and the Big Leg Break is that when these deliveries go wrong, the ball will come out of the hand with a scrambled seam and frequently land on the smooth surface of the ball and Slide On. Far from being a complete disaster, what you’ll end up doing is bowling an unintentional variation. Looked at in a positive manner you could argue that this is an attribute of bowling the Orthodox Back-Spinner? The difficulty in trying to establish the facts with regards the more obscure back-spinning deliveries is the fact that a key part of Spin Bowling strategy is the psychological aspect of the game. From the earliest days bowlers have claimed to possess a mystery ball and this is especially true of Spin Bowling. From the Internet………..
Here’s an article written by Bob Simpson who trained Warne in the early days. A clever bluffer on the field, he didn't mind using the media to his advantage, especially at the start of each season when he'd announce the discovery of his latest "mystery ball". His opponents would see the headlines everywhere about something that didn't exist. In reality, there was never a new trick, only a revamping of the name for Peter Philpott's "back spinning toppie". Shane originally called it his zooter, now he calls it his slider and over the last decade or so the ball has brought him numerous lbw decisions. What there was, though, was a further improvement in his accuracy and flight. He was always fine-tuning his bowling and increasing his arsenal. It has to be recognized that the popularity of Wrist Spinning and therefore the proliferation of these supposed new variations since the 1990’s is probably down to Warne as the article above indicates. The suggestion by Bob Simpson is that there never has been a Slider, Zooter or whatever and that the back-spinner that Warne bowled was always the Orthodox Back-Spinner. Warne and the team that surrounds him, be it trainers, captains, marketing men or the Australian cricket board have obviously been involved in hyping him up as much as possible. 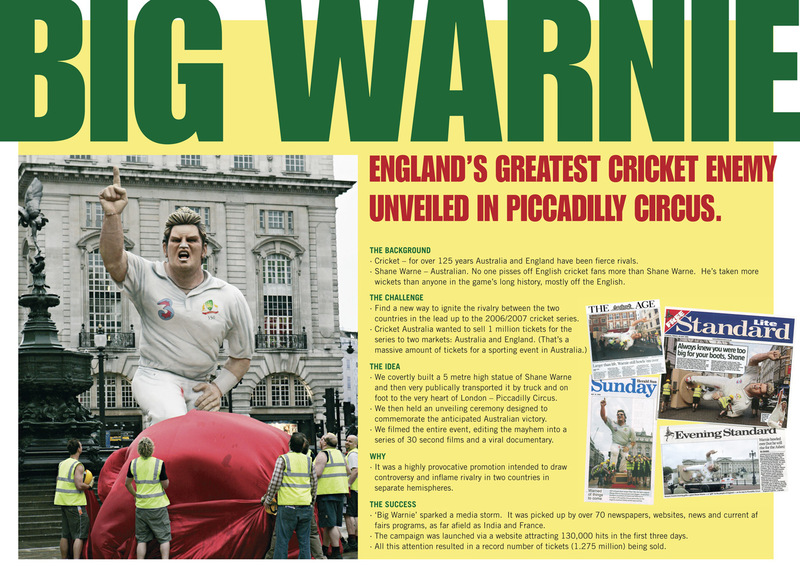 For instance in 2005 prior to, or during the matches in London a giant effigy of Warne was driven around the streets of London on the back of a lorry in an attempt to remind England, that ours was a lost cause. Just type in 'Big Warnie' in Youtube and you'll get some sense of the extent Warnes marketing/propaganda machine used to go to. There have been adverts, documentaries, books and articles throughout Warnes career that serve to remind everyone about his genius and proliferation of deadly variations. But some of his most powerful media weapons I reckon are those based around his associations with Mark Nicholas and Terry Jenner. There was for a while a clip from years ago of Warne doing his now familiar demo of his deliveries. The clip appeared to be no-where near as slick as the ones that he did much later in his career, but did feature Mark Nicholas in exactly the same role – asking questions of Warne and then Warne showing the kids. But then look in the background of this old clip and who else is there amongst the kids – some of the English batsmen! They appear to be there trying to learn and un-ravel what it is that Warne does, so that they can possibly hold out some hope of surviving against him next time around? It strikes me that in the great tradition of Wrist Spinners this would have given Warne the perfect opportunity to weave his web of deceit….. ‘Yeah I’ve got em all mate….. Leg Break, Toppie, Wrong Un, Orthodox Back-Spinner, Slider, Zooter, Flipper and the Zinger’. You can just see Graham Gooch walking back to the dressing room and telling the rest of the England blokes ‘He’s got variations coming out of every orifice’!!! But, if you go looking for these other variations you start to see a pattern arising. Certainly when they get mentioned in books by third parties – authors on the subject of cricket in a generic sense, invariably they’re mentioned in conjunction with a handful of names – Warne, Jenner, Benaud and Doug Ring. But mentioned in a manner that has no clarity or certainty, as Philpott mentioned earlier, most of these bowlers had at least 2 back-spinners, but they would never divulge their technique. The Flipper and Orthodox Back-Spinner perhaps? So it does seem that all the other variations that go by a number of different names cannot be pinned down and verified in the same way as the two ‘Prime’ back-spin deliveries. Warne himself describes in videos and articles written by 3rd parties all of these newer variations in a number of different ways, contradicting himself and generally confusing the issue and establishing very little that can be described as concrete. He mentions them in a number of different ways, making references to bowlers in the 1950's who as Philpott writes were also in the business of keeping these deliveries secret as a part of their guile and strategy. It strikes me that the more you investigate, the more the truth becomes murkier when applied to the new variations. 5. The front foot commiter who wants to get down the track at you all the time: With 5, I would have kept on spinning hard over the top, throwing the ball up and gradually widening on him. But as the years went by, I would have zooted back-spinners at him, holding him back and hoping to frustrate him/or change his plan of attack, then thrown up the Top-spinning Leggie a little wider of the Off-Stump. In the context of this paragraph, the word Zoot is used as a verb in conjunction with the bowling of the Orthodox Back-Spinner. This led me to looking into whether the word was an Australian slang word that combined two words such as Shoot and Zoom/Zip to create a potentially more dynamic and energetic word....... Zoot. One suggestion was made (with no substantiation) that, Philpott who works tirelessly even to this day with kids teaching them Wrist Spin, may have used the word coloquially/Slang style to engage kids with their bowling. Maybe adapting the use of Zooting the ball in to Zooter to describe the Orthodox Back-Spinner? The name, Orthodox Back-Spinner is a right mouthful and at best a bit dull when teaching small boys how to bowl wrist spin. It's easy to see that many people coming into contact with Philpott having that sense of being within the inner circle of Australian Spin history would readily adopt the esoteric language of their great master Philpott. So could this possibly be one explanation as to why people confuse the Orthodox Back-Spinner with the term Zooter and even use the description? (9) Zooter: During the training for the tour of Sri Lanka, Shane basically relied on his big spinning leg breaks and flippers. He didn't bowl the googly, and his normal top-spinner was only fair. When I asked him if he knew how to bowl a top-spinner through the front of his fingers he seemed surprised. He seemed even more bemused when I said Peter Philpott, the respected Australian leg-spinner of the 1960s, called it his "back spinning toppie". I could never understand why either. Perhaps my aerodynamics weren't as good as Peter's. I showed Shane how it was done and while I thought it would probably take him six months to master it, he was bowling it in a Test match three weeks later. A terrible irony of his life is that the media have sometimes come down hard on him, exploiting those moments when he let himself down off the field. I say `irony' because, being a clever bluffer on the field, he didn't mind using the media to his advantage, especially at the start of each season when he'd announce the discovery of his latest "mystery ball". This last bit here by Bob Simpson (9) is probably the most telling. This to me supports my argument that the term Zooter is anomalous and that there isn't really a clear definition of it and the confusion is all a part of the Warne/Jenner propaganda machine. If the Zooter is indeed just another name for the Orthodox Back-Spinner like Bosie/Googly/Wrong Un, which I'm quite willing to accept, there seems to be an awful lot of people writing about it and getting it wrong with all those 'Non-Spinning, out of the front of the hand' descriptions? The Orthodox Back-Spinner is ripped off the fingers using the wrist to impart the flick like all of the classic Wrist Spinning deliveries, so why the confusion? Simple….. As it says on the Cricinfo website “Some question whether the delivery has ever existed, for it could be another of Warne's mind-games to keep his opponents on their toes”. I would suggest that indeed this is the case. There seems to be some recognition of a delivery that has attributes similar to the Knuckle-Ball used in baseball. Indeed, many Spin Bowlers have toyed with the idea of adopting some of the techniques used in Baseball and Philpott amongst others advocates exploring such ideas. It could be the case that Warne has used a variant of the Knuckle ball and this is where this description of a straight ball being pushed off the palm of the hand comes from? If you look into the Knuckle ball, you’ll possibly find that its reported as having the weird property of ‘Wobbling’ through the air appearing to turn one way and then another through its trajectory. Further investigations explain this is due to the stitching pattern on the ball which is very much different to a cricket ball. Therefore the use of such a delivery is subject to personal investigation and experimentation. (10) The Slider: In cricket, a slider is a type of delivery bowled by a wrist spin bowler. Whereas a top-spinner is released with the thumb facing the batsman, a slider is bowled with the thumb facing the bowler. On release the wrist and ring finger work to impart backspin to the ball. A top-spinner tends to dip more quickly and bounce higher than a normal delivery. The slider does the opposite: it floats to a fuller length and bounces less than the batsman might expect. The classic slider heads with its seam aligned towards the batsman and may tend to swing in slightly. Sliders may also head towards the batsman with a scrambled seam (with the ball not spinning in the direction of the seam, so the seam direction is not constant, unlike in conventional spin bowling). This has less effect on the flight and bounce but absence of leg spin may deceive the batsman. It is claimed that Shane Warne invented this type of delivery. However, this is inaccurate. The Australian spinner Peter Philpott used the technique in the 1960s, calling it simply an orthodox backspinner, while Australian all-rounder and captain Richie Benaud used what he called his 'sliding topspinner' which appears again to have been similar. Since he was taught the technique by Doug Ring, it may be more accurate to suggest that Ring is the originator. Either that, or the ball is one of those deliveries with no easily identifiable point of origin. Again, you can see that like the Zooter, the Sliders origins and existence are as equally as murky. Description (11) from Wikipedia immediately states that it (Slider) is in fact The Orthodox Back-Spinner and its description is that of Philpotts ball. The conclusion at the end suggesting that the ‘Ball is one of those deliveries with no identifiable point of origin’. Entry No.15 is interesting again in exactly the same way that No.4 is. This website (No.6) describes all the Wrist Spin deliveries with a degree of reasonable knowledge listing them all, but instead of listing the Orthodox Back-Spinner by its real name, the bloke opts to call it the Slider. I was going to go through a number of websites, but to be honest they’re all virtually identical and almost without exception include the phrase ‘It’s the opposite of the Top Spinner with the Thumb facing the bowler in the delivery’, which basically tells you it is the Orthodox Back-Spinner. So, I’m now moving towards a final conclusion, which I think I’ve offered enough evidence of and that is........... When it comes down to it the Orthodox Back Spinner (first recorded properly by Philpott) is exactly the same as Bosanquets Off-spinning delivery in that it no longer has one fixed name. Bosanquets ball is the Wrong Un/Googly/Bosie with Bosie seemingly being the most obscure term used for it, and possibly the original name? Philpotts ball is the Zooter/Slider/Orthodox Back-Spinner with the last name seemingly like the title 'Bosie' gradually disappearing into obscurity despite the fact that this is the deliveries real name. There is plenty of anecdotal evidence that, in the same way Christopher Columbus wasn’t the first European to discover the USA, Peter Philpott probably wasn’t the bloke that invented the Orthodox Back-Spinner. In his own book Philpott writes about the existence of Back-Spinners over the period between Grimmett and himself………. Outstanding Wrist Spinners since Grimmett have all developed their back-spinner, some innovative ones amongst them, and almost all these bowlers have persistently refused to discuss the mechanics of such deliveries. That's how important they were to them, and perhaps explains why so many non-wrist spin cricketers were and are totally ignorant of them. He then goes on to virtually credit the ball to Benaud…………. Despite the innovators, however most Leg-Spinners have relied on the Orthodox Back-Spinner. This is the one I referred to with Richie Benaud, a delivery he bowled superbly and, at times almost used as a stock ball. Peter Philpott; The Art of Wrist Spin Bowling; Crowood Press Ltd, Marlborough; 1995. Again it’s clear that the origins of the Orthodox Back-Spinner like most deliveries are obscure, but as first mentioned at the start of this piece in order to pin the delivery down in an academic sense you need to find the first recorded definitive account of the ball in detail and despite the fact that Grimmett wrote three books, one of which includes the Flipper descriptions and probably some of the earliest accounts of the Wrong Un, Top-Spinner and Leg Break, there is no mention of an Orthodox Back-Spinner. The next easily traceable mention of a Back-Spinning delivery other than a Flipper is the story of Doug Ring showing Benuad a back-spinner………. After the Lord's Test of 1953, Doug Ring picked up an apple on a train journey and showed a young Richie Benaud how he bowled the slider, pushed out of the front of the hand between the second and third fingers. And there, in essence, was Warne's armoury: the original legspinner and top-spinner, the googly, the flipper and the slider. While Australian allrounder and captain Richie Benaud used what he called his 'sliding topspinner' which appears again to have been similar. Since he was taught the technique by Doug Ring, it may be more accurate to suggest that Mr Ring is the originator. Either that, or the ball is one of those deliveries with no easy to identify point of origin. The slider (a straight ball delivered from the front of the hand) is to be compared with the zooter (a straight ball delivered out of the back of the hand). So, just as we’re about to get our teeth into something different – “the slider, pushed out of the front of the hand between the second and third fingers”. Further investigation muddies the waters again. I must admit, I’m not a big fan of Benaud and have read little on him, so I’m not sure as to whether he ever committed descriptions of his deliveries to text, but I’m fairly certain he never did. Prejudices aside though, I like the account of Benauds Slider, it sounds like the ball that I refer to as the Mickey Mouse Slider alluding to the fact that it’s an easily learned bastardised variation of the real thing. How I came across this, I don’t know, but it may well have been the account above. I’ve also heard Warne describe this delivery too and had discussions with people all round the world on forums who also relay the same experience and anecdotal references to Warne speaking about it. Throughout this research and putting this piece together I’ve noticed that there have been two descriptions that pop up here and there that allude to two mystery balls that get accredited with the name Zooter and Slider and yet their descriptions differ fundamentally to the Orthodox Back-Spinner which as we all know is a stable-mate of the Top-Spinner, Leg break, and Wrong Un as they all use the same grip configuration, wrist action and flick to impart the spin. My take on the Slider prior to writing this piece was that one of its key features was that – on hitting the surface of the pitch the ball would ‘Slide through’ rather than respond in an adverse way caused by hitting the seam. I always thought of the Slider as a ball that by design would hit the smooth surface of the ball more than it would the seam? Neither the Orthodox Back-Spinner or the Flipper if bowled correctly would do this and therefore the term Slider used in conjunction with these deliveries – especially the Orthodox Back-Spinner is wholly anomalous as far as I'm concerned. The Mickey Mouse Slider: Holding the ball using the two up two down grip, have all the fingers in place to bowl a Leg Break, but through the bowling action straighten the cocked wrist smoothly (Not a flick) and position the wrist ready to bowl a seamers ball by dragging the two up fingers down the back of the ball to impart the spin, the fingers will be across the seam and the seam will rotate over itself or come out scrambled. With this delivery there’s potential for the ball because of the seam presentation - for the ball to land hitting the seam sideways in which case the ball will bounce in an unpredictable manner or the ball will land on the smooth part of the ball and slide through. This allows a much faster flatter delivery that, because of the back-spin slides in and keeps low with the added potential of doing something unusual if it comes into contact with the scrambled seam. Before writing this article this is the ball I always thought was a Slider by design. There are other potential Sliders which are accidental deliveries which come about through trying to bowl The Big Leg Break and the Orthodox Back-Spinner both of which are exceptionally difficult deliveries to master. In practice both in games and during training at all levels I believe that anyone attempting to bowl perfect deliveries of the ‘Advanced’ variations – (Big Leg Break and the Orthodox Back-Spinner) the execution is going to go wrong and the ball wont land on the seam and in these incidences the ball will Slide through. In these cases if the ball does something unusual you’re just simply going to claim it as one of your many variations and because of it’s attributes these accidental deliveries could be claimed as ‘Sliders’ in the generic sense of the term? The other contender for a completely new variation is the one that conforms to the description here which crops up again and again being described as a Zooter. Again if we’re going to stick with the premise that the Zooter and the Slider are indeed different names for the Orthodox Back-Spinner, this ball here which is completely different but seemingly used by Warne needs to be assigned a name and described in detail by a professional in a book in order that it’s verified as a legitimate delivery……………. The Un-named variation ; From Shane Warne’s biographer………. Basically this ball comes out of the front of the hand, with the fingers running across it sideways, like a legbreak - but the ball is propelled more by the palm. It's not unlike a knuckle ball, but not as slow. This delivery does very little in the air or off the pitch - which is part of the point. It sort of wobbles down. These two obscure deliveries were the ones that I was hoping would prove to be the real contenders for the Slider and the Zooter, but all the evidence that I’ve been able to collate as previously mentioned point to the conclusion I’ve already made. So it seems as though these two deliveries could well be legitimate and useful deliveries with their place amongst a Wrist Spinner armoury, but as yet no-one has seen fit to describe them in a book and therefore are evolutionary balls.